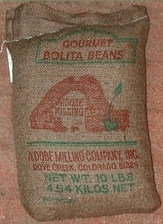 Adobe Milling Recipes and Cookbooks to help you make the most of our gourmet products. Here are some recipes to get you started. Use the button below if you would like to contribute your own recipe! Add 6 cups fresh water and cook beans 1.5 hours or until tender at a gentle boil. Drain beans, save liquid. Saute onion, green pepper, garlic and bacon. Mash beans together with sauteed mixture, adding liquid a little at a time, until bean mixture is smooth. Can be frozen. Serves 6 to 8. Several years ago, a friend from Colorado gave me some Anasazi beans and now they are the only beans I cook. Everytime I serve them to someone new, they just go on and on about how good they are. I am so glad to see you ship via the 10, 20 and 50 pound bags. These make great gifts and are always a pleasure to cook in my own kitchen. Since these beans cook faster than other beans, they are a cook's delight!! I often cook a picnic ham, saving the juice and ham bone for my beans. Cook under slow fire until beans or tender.